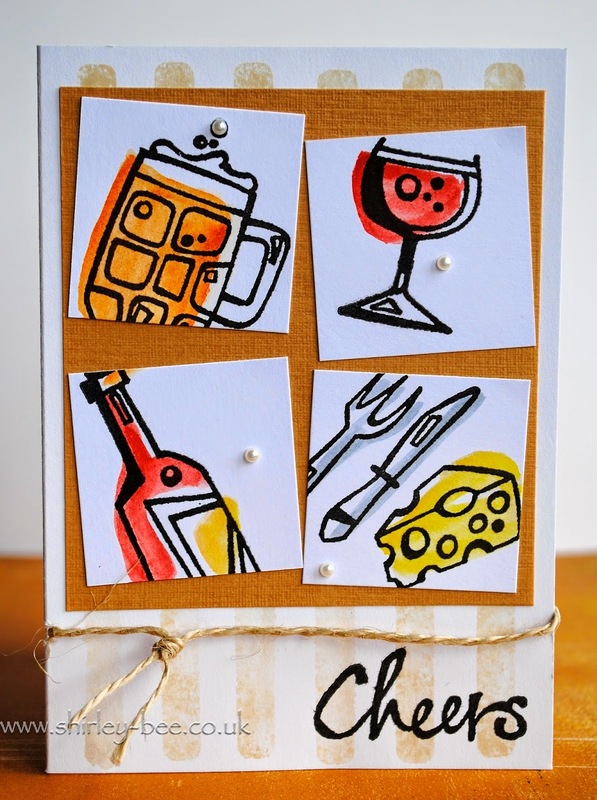 shirley-bee's stamping stuff: Just Us Girls - Guest Designer! I thought I'd go wonky with the four panels, so I stamped images from Woodware across the panels, then sloshed Distress Inks over the images, deliberately going over the lines and offsetting the colours. I adhered the panels at different angles to emphasise the wonkiness. The background pattern is stamped using the back of a strip stamp. 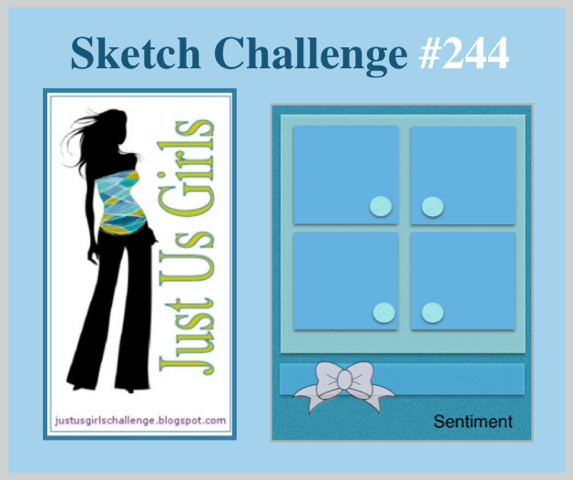 Head on over to the Just Us Girls blog to see what the design team have created with the sketch and join in! I just love the way u do that sloshing around colour... I think I need some lessons from you.. Fabulous card. Welcome Shirley! Your card is so much fun with your wonky design! Very cool how you "sloshed" the colors on those images. Awesome job with this sketch. What a fun card! Love the way you have colored those wonderful images. So glad to have you with us this month at JUGS! Looking forward to sharing your beautiful cards. Hey there Shirley! Your card is wonky and wonderful! Great job with the challenge and for thinking outside the box and creating something so unique! Welcome again...and enjoy your weekend! What a great card! I love the design! Great take on the sketch! Just love the wonkiness! Congrats on being a GD!!! You will be fabulous! I absolutely love the wonkiness of your card! Those images (and the way you colored them) are so cool! Love this card! Welcome to JUGS for this month! So glad to have you joining us! awesome...I want to come and stamp with you...you are so inspiring! What a fun design, I like that those squares are placed asymmetrically :) congrats on GD spot ! Go Shirley! Love the total wonkiness. And those images are fabulous! So great to have you with us, Shirley! Love your card, too! The off-stamping can be tricky and your design is fab! What super fun images! Love what you did with the sketch!